Replace "believe" with "claim" or "argue." Who knows what P-Krug believes. If minimum wage is acting as a sort of price ceiling, I can see how increasing it would lead to an increase in jobs. Think of a game where companies can choose to pay minimum wage or they can pay an "efficient*" wage. Due to , there are multiple equilibria and companies get stuck at the "pay minimum wage" equilibrium even though "pay 'efficient' wage" has a higher overall payoff. Raising the minimum wage might kick companies out of the lower equilibrium, or at least bring the "minimum wage" payoff closer to the "efficient wage" level. I don't think there's any real world support for that model (but I'm also not well versed on the literature,) but it is a way to be logically consistent and does explain some of the rhetoric behind the "raise the minimum wage" crowd. For example, I've heard the argument that raising the minimum wage will encourage people who are more skilled to join the labor force, that could be consistent with a multiple equilibrium game. *By "efficient," I mean equilibrium wage where Wage = MRP | Price = Marginal Cost | Supply = Demand; what you would normally call an equilibrium wage. But since I'm talking about equilibrium in game theory as well, the terms started getting confusing so I substituted "efficient" for the wage level. Wow, home run Warren. Both Cafe Hayel and Carpe Diem reposted this one. Looks like you're gonna get a surge of new readers ;^). that is an enormous supposition that has no evidence to support it. it is also directly contradicted by overwhelming evidence. it also presumes a level of consistency in the economy that is not present. if all enterprises were monolithic and we all trapped at some sort of local but not general maximum, then MAYBE such an approach would work. but neither assumption is even remotely plausible. companies, cost structure, supply of labor with specific skills, productivity, etc are massively heterogeneous. the notion that one size could fit all is absurd even if one believes in this (also deeply implausible) notion of companies being "trapped" at an non efficient local maximum that is lower than the general one. all companies would have to be trapped there. and even if they were, the rise in wages without a rise in production causes a drop in productivity form labor. this results in greater marginal capital substitution and therefore job losses. there is really no plausible mechanism whereby a hike in minimum wages creates jobs. Minimum wage is a price floor, not a price ceiling. 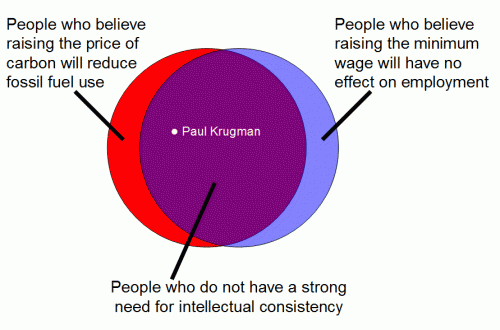 Krugman is VERY consistent - he is intellectually dishonest 100% of the time. Paul Krugman: He's a dwarf. He's a turd. He's a dwarf AND a turd! Until I saw your Venn diagram, I thought your hed was incomprehensible--there is no intersection between Paullie "The Beard" Krugman and Consistency. I know! He believes he is always right. "companies, cost structure, supply of labor with specific skills, productivity, etc are massively heterogeneous." Generally correct. So companies work to differentiate their products in ways that may (not) matter. The company that is able to innovate a way to "build a better mouse trap" will own the market. If it is patentable, they can protect it that way. Many products are not patentable--nor are many processes. Which is why "trade secret" is so important--it can not be protected any more than trying to patent a color. I also love when Krugman talks about the unemployment problems in the Euro countries like Spain, Greece, Portugal; he repeatedly stresses that, since the Euro countries can't devalue their own currencies, their best bet is to go through "internal devaluation," where the prices of goods and *labor* become cheaper relative to other European economies on the Euro. So in Europe, lower wages increase the demand for labor, but in the US, of course, higher wages have absolutely no effect on the demand for labor. In the 1970s, it was common for leftists to claim that increasing fuel prices would not reduce fossil fuel use and that's why price decontrols would not work. At least now they're right half the time. There you have it. You cannot formulate public policy with price controls on cigarettes, gasoline and soda where the intention is to reduce demand, and simultaneously believe that ratcheting the cost of labor to artificially high levels, and above unskilled labor's value-add will have no impact on the demand for labor. The wonders of Socialist thinking. But then this is a group that thinks you can borrow your way out of debt and that raising taxes increases rather than decreases GDP. The Nobel Prize committee if it had any sense should ask for its medal back. I don't think he's dishonest. He believes everything he says. Raising the price of carbon will make people who buy carbon buy less carbon, all things being equal, and; raising the price of labor will cause people who buy labor (employ people) to buy less labor (employ fewer people) - then maybe we could all agree and chuckle at the Venn diagram of how Paul Krugman is so very intellectually inconsistent and always wrong. However, you are overlooking a major issue. In the second argument all things are not equal. A raise in the minimum wage, particularly a large one to $15/hour, would put more spending power in the hands of spenders and would increase demand. Minimum wage workers spend every penny. Much for consumables and in businesses that would have to hire more workers to meet the demand. Ah, the "Magic Pudding" defense. I like it. McDonalds should pay its workers $15 an hour. That's all I want. He's a really, really HUGE, ambulatory sack of excreta. The fun part about that is you could probably say it to his face and 50% of his fans would have to have it explained to them, and the other half would take ten minutes figuring it out. This requires that you overlook a major issue how raising the minimum wage affects the employer. No, he doesn't believe everything he says. He is a liar--an intentional teller of falsehoods. Name a progressive who doesn't lie? Bet ya can't. Right. Employers will do nothing in response to increased labor costs. It's not like they'll cut back on hours, or adopt labor-free technology, or raise their prices. Noooooo....increasing minimum wage is a one-way ticket to prosperity for everyone!! !